The properties of soft cohesive soils can be improved by mixing of a variety of chemical additives. The addition of lime, fly ash and cement in different combinations can significantly improve the shear strength and compression properties of such soils. Other additives can be used to fix pollutants in place to prevent leaching or to reduce soil permeability. Deep soil mixing (DSM) is achieved using either a wet or a dry process where metered quantities of additives are injected into the soil through the hollow stem of a rotary drill string fitted to a drilling rig. The method helps to achieve significant improvement of mechanical and physical properties of the existing soil, which after mixing with cement or compound binders becomes the so-called soil-mix (or soil-cement). The stabilized soil material that is produced has a higher strength, lower permeability and lower compressibility than the native soil. There are two different mixing methods of deep soil mixing. The existing soil which has to be improved can be mixed mechanically, either with a slurry including binder (wet DSM) or with a dry binder (dry DSM). Jetting of slurry can be also used to boost the mechanical mixing. The wet method is more appropriate in soft clays, silts and fine-grained sands with lower water content and in stratified ground conditions including interbedded soft and stiff or dense soil layers. The dry method is more suitable for soft soils with very high moisture content, and hence appropriate for mixing with dry binders. This method consists of a special mixing tool which is inserted into the soil on site. This mixing tool comprises of a drilling rod, transverse beams and a drill end with a head. The drilling does not cause any vibrations, and is accommodated by cement slurry outflow from nozzles intentionally placed at the end of the soil auger. When the design depth is reached, the construction phase of deep soil mixing (DSM) columns is started. Mass wet soil mixing is carried out with a horizontal axis rotary mixing tool at the end of a track hoe arm. The binder slurry is injected through a feed pipe which is attached to the arm. This technique creates individual soilcrete columns, rows of overlapping columns, all of which have a specific design strength and stiffness. Wet soil mixing is suitable to any soil types which includes even organic soil. With this method, the treatment of soil is possible to depths up to 100 feet. Dry soil mixing is a ground improvement technique that mechanically mixes the soil with dry cementitious binder to create soilcrete so as to improve the weak soils such as soft, high moisture clays, peats. 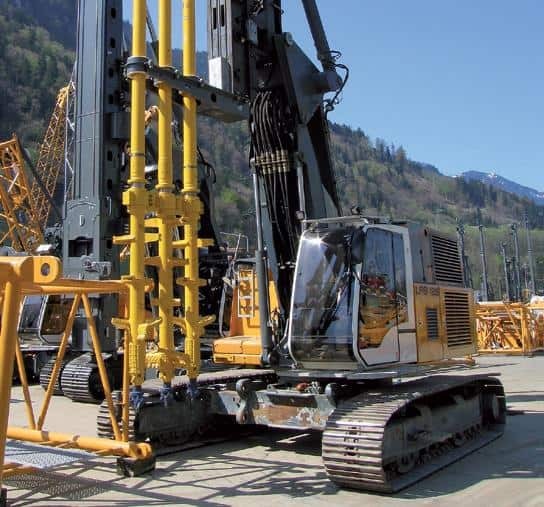 A high speed drill moves into the ground with a drill rod which has radial mixing paddles near the bottom so as to construct the columns. 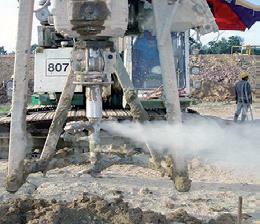 During the penetration of the tool into the ground, it shears the soils to prepare them for mixing. As and when the tool the specified design depth, the binder is injected through the drill steel where it is assorted with the soil as the tool is taken out. Mass dry soil mixing is carried out with a horizontal axis rotating mixing tool positioned on the end of a track hoe arm. The binder is injected to the soil mixing tool through a feed pipe, which is attached to the track hoe arm. With dry soil mixing, the treatment for the soil is possible to depths up to 60 feet. Obstructions are sometimes pre-drilled ahead of the soil mixing process. 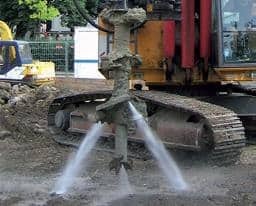 When there is need for ground improvement work or site remediation and the soil is very weak or contaminated soil with high water content such as deposits of dredged sediments or wet organic soils or waste sludges , shallow dry mixing provides a cost-effective solution. In this method special mixing tools are used which are usually fixed to an excavator’s rig arm. Stabilization is performed in phases which is according to the operational range of the drilling rig. This normally comprises an area of 8 to 10m2 and depth up to 4m approximately. When the necessary binder volume has been applied, mixing is continued to make sure of the optimum mixing properties.